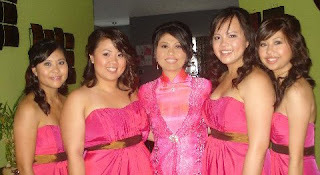 Thuy wedding is finally here. I am so excited cuz it feels like forever that Thuy Ngyuen booked me. I LOVE HER...she is such an awesome girl. Thuy is getting 2 looks for her wedding. The first makeup look will be a soft pink and the second look I will bump up still using pink but more evening, more pop. I am meeting Thuy at 6am for makeup and Erin Carter the hair stylist she couldn't make it. So Thuy was able to find someone else like 30 mins before the cars arrived. F.Y.I. I didn't do Thuy girls makeup. I only did Thuy and her mom who is not in the picture. I don't take credit for others work. I would give a shout out to the hair people in the makeup artist but I am not sure who it is.